This part of our website is about the terms and conditions on which we step into a legal agreement with our clients and vice versa. It is important to note that every signed document between the Company and the Client is legally binding and is subject of the UK contract law. 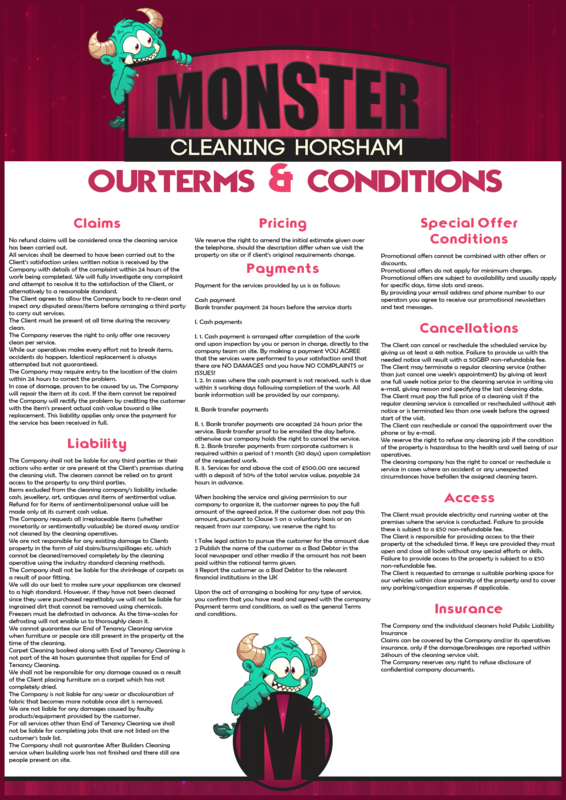 No deposits are required to be made upon booking our Company for cleaning services and a hire can be cancelled prior to its start. Upon finishing the project, the client must pay in full the price according to the price list of the Contractor. Our knowledge and information regarding the cleaning process and the operations of the company are protected by copyright law and violators will be sanctioned. If any questions arise regarding this for or if more information is required please call our numbers and speak to a customer service associate.